THE ROYAL MOROCCAN Football Federation (FRMF) sought clarity regarding Lionel Messi’s injury having been frustrated to learn that Argentina would be without their star man for Tuesday’s friendly. That ailment will keep Messi out of Argentina’s trip to Tangier, as was confirmed to Morocco in a letter on Saturday. 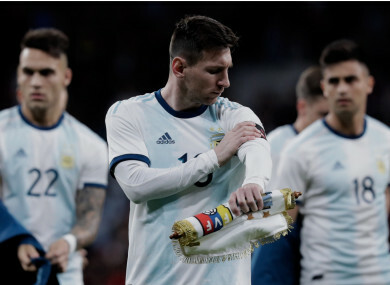 But having agreed with Argentina that their best team would be on show, the FRMF asked for a further explanation, seemingly seeking to ensure Messi’s injury is genuine. A statement from the federation read: “The FRMF on Saturday received a letter from the agent of the friendly match against Argentina, officially confirming the absence of Lionel Messi. “According to the same letter, the agent confirmed that the Argentine Football Association said that Messi had been injured in a match against Venezuela on Friday in Madrid, and that he directly joined Barcelona for treatment. “The FRMF asked for clarification from the match agent, approved by the Argentine Football Federation, after news of Messi’s absence from Tuesday’s match in Tangier. It is worth noting that the FMRF had agreed in the contract organising this friendly match to face Argentina’s first team. Email “Morocco seek clarification over Messi injury after agreeing to face Argentina 'first team' in friendly”. Feedback on “Morocco seek clarification over Messi injury after agreeing to face Argentina 'first team' in friendly”.